Beyond Scotland, ex-pat Scots and a few informed corners of Britain as a whole, not many people would have heard of William Wallace before the 1995 film, Braveheart. The American, Mel Gibson, directed and starred in the movie, playing the downtrodden, noble, medieval Scottish hero battling the evil English, led by Patrick McGoohan – who depicted a particularly villainous King Edward I. Wallace comes across as a kind of Mad Max meets Lethal Weapon meets Nelson Mandela painted blue and wearing a kilt. However, for all its historical unreliability, Braveheart is a great film of the ‘goodies and baddies’ type, with acres of armour, scores of swords and buckets of blood (and gore). Even English audiences can boo the baddies; in Scotland, the film probably increased membership of the Scottish Nationalist Party almost overnight – particularly those in the 0-16 age group. Despite Mel’s best propagandist efforts, then, you may think it sad if there remained a small number of poor uninformed souls in remote places – Birmingham, for example – who are ignorant of Wallace and do not realise that he was a real person, and a Scottish idol. Indeed, William Wallace has an almost mystical quality to many Scots. The reality is that Wallace bravely and briefly frustrated Edward’s plans 700 years ago to unify Britain under one crown (Edward’s), was unjustly tried for treason and then met a cruel and barbaric death. We don’t know much about his life (there’s a brief summary in this article about the Wallace memorial in Smithfield, London). In the end, Edward’s ambitions were thwarted by his own demise 2 years after Wallace’s awful execution, the Scots that united under Robert the Bruce dealt the English a blow at the Battle of Bannockburn 7 years later and it took a Scots king, James VI, to unify the crowns about 300 years after that. So what’s all this about a National Wallace Monument? It is debateable how much Wallace, though undoubtedly a good Scotch egg, achieved for his country – which was hardly a unified political entity at the time anyway. Maybe there’s a theme here; if you search for Scottish heroes on the internet, up comes an official-looking Scotland website which lists, amongst others, Bonnie Prince Charlie, Mary Queen of Scots and Greyfriars’ Bobby – two more failures and a wee pooch? Derision of course misses the point – a sense of pride in the underdog who refuses to be beaten coupled with the tremendous, timeless, power of myths. Heroes and national emblems don’t necessarily rely on the inconvenience of facts in order to inspire – look at the enduring legend of King Arthur and, more recently, the English football team. 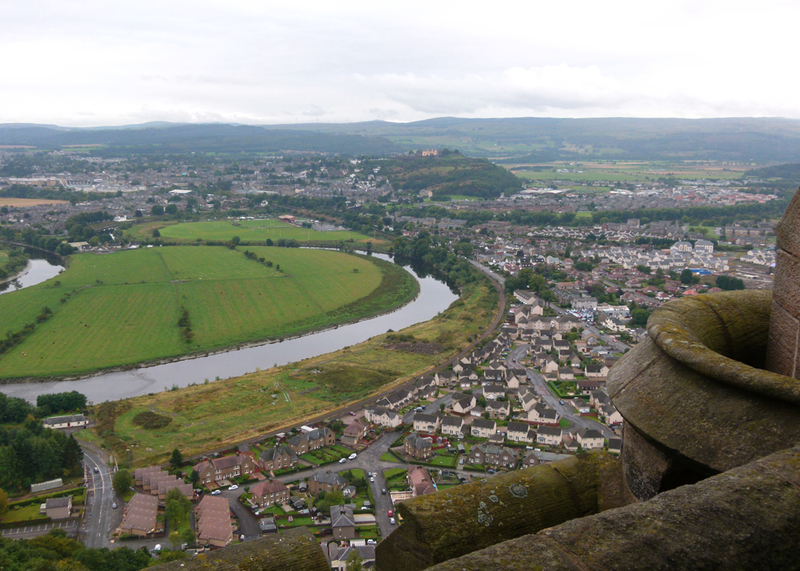 It was in similar spirit, and perhaps in the context of maintaining Scotland’s unique identity in the wake of Sir Walter Scott discovering the Honours of Scotland (Scotland’s crown jewels – see Edinburgh Castle), that a National Wallace Monument was proposed in the 1830s. It was decided to site the monument in Stirling – a fair compromise between auld rivals Edinburgh and Glasgow – and on the Abbey Craig, a 300 foot (91 metre) high hill where once an Iron Age fort stood, and from which Wallace is said to have watched Edward’s troops arrive before the Scots’ victory at the Battle of Stirling Bridge on 11th September 1297. 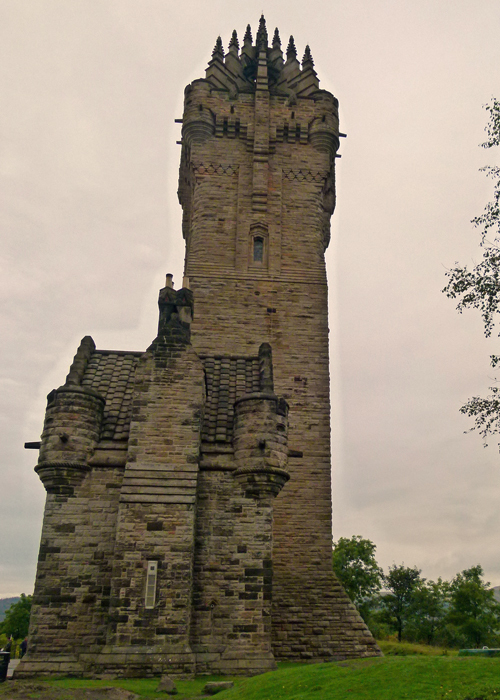 Funds for the Wallace Monument were raised by public subscription; the cost of construction was in excess of £10,000 according to Stirling Council and as much as £18,000 according to Wikipedia. It is said that amongst the foreign contributors was Italian nationalist leader Giuseppe Garibaldi (which just about takes the biscuit). 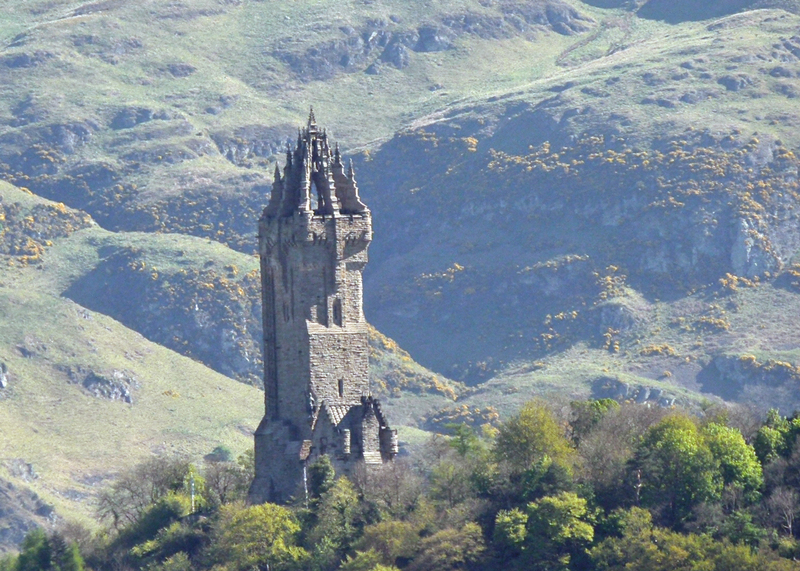 The National Wallace Monument was 8 years in the building and completed in time for the 572nd anniversary of the Battle of Stirling Bridge on 11th September 1869. 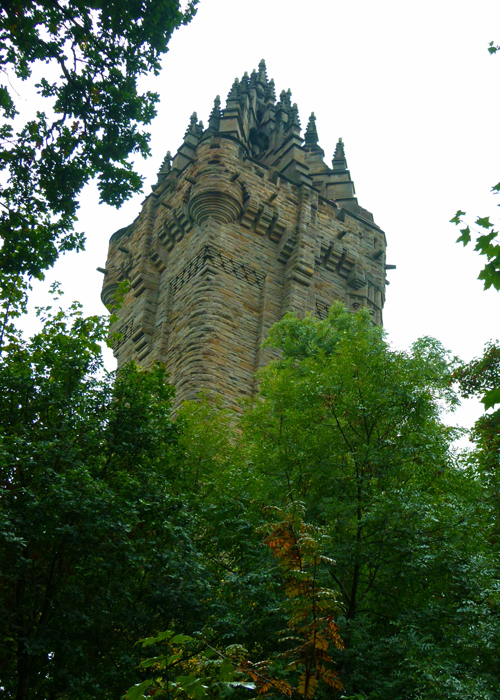 It is an amazing structure, 220 feet (67 metres) high in Victorian Gothic/Scottish Baronial style. 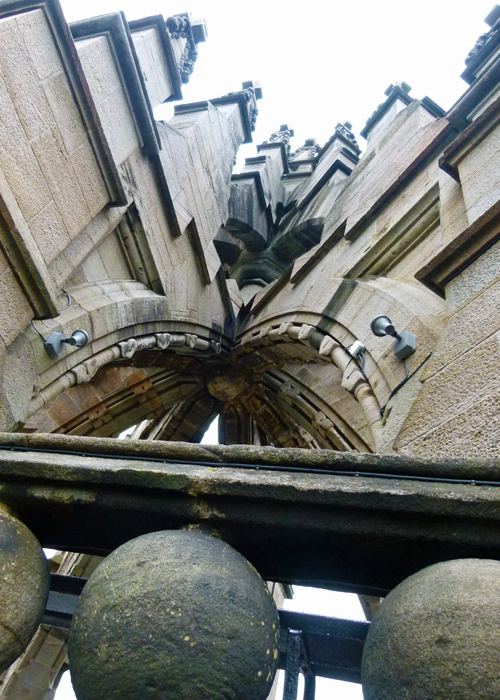 The walls are at least 5 feet (1.5 metres) thick – in places an astonishing 16 feet (5 metres) – and there are 246 steps, mostly in a fairly narrow spiral, to the top, a spectacular stone crown affair reminiscent of St Giles’ cathedral in Edinburgh. The views are impressive, though the battle site of Stirling Bridge in front of the castle is now largely built over, unfortunately. Beneath the crown are three chambers. The first is largely dedicated to medieval weaponry and an explanation of the Battle of Stirling Bridge – a joint triumph for Wallace and his co-commander, Andrew de Moray; de Moray, however, was mortally wounded in the battle. 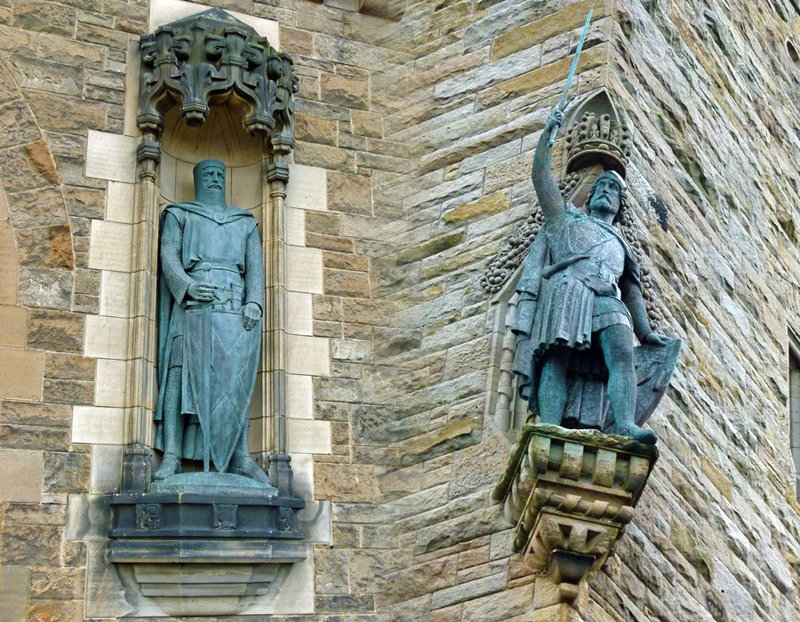 The second chamber of the Wallace Monument, Hall of Heroes, contains the busts of 16 notable Scots, including Robbie Burns, Robert the Bruce, David Livingstone, Walter Scott, James Watt, John Knox and Adam Smith. According to the National Monument’s website, “Every one of the characters profiled in the gallery has reflected the spirit of William Wallace through their commitment to liberty, through their opposition to discrimination and inequality, and by the lengths which they went to in order to improve the lives of other people.” Hmm; really? Alas, they have not yet got round to including Sean Connery, Alex Harvey, Lonnie Donegan, Billy Connolly, Annie Lennox, Chris Hoy – or, indeed, Nicola Sturgeon – all of whom undoubtedly meet those criteria as much as those whose busts are already there. Even more puzzling; Greyfriars’ Bobby has been left out. However, I am glad to see that they will be gradually adding heroines, to redress the hitherto male dominated hero-elite. So perhaps we should expect to see Flora MacDonald, the Countess of Nithsdale and Mary Somerville joining the heroine ranks quite soon. 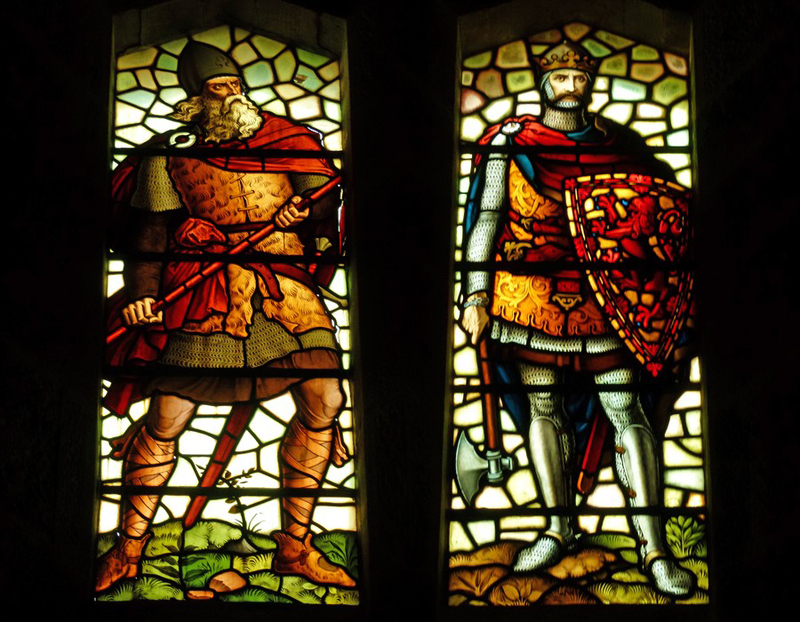 The room also contains some rather nice stained glass as well as a 5’8” long medieval broadsword, or claymore, which is reputed to have belonged to Wallace and to have been used by him at Stirling, as well as at his defeat at the Battle of Falkirk the following year. The sword weighs 6lbs (2.7kg). Imagine swinging that – and keeping your balance! Whoever used it must have been big, and immensely strong. 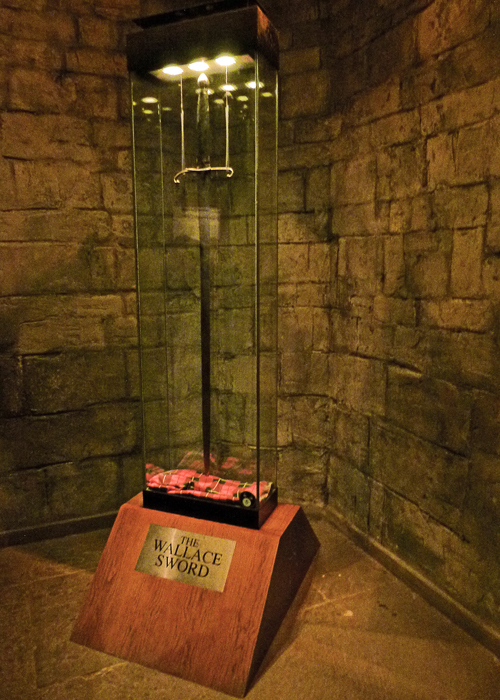 Attributing the sword to Wallace, however, is uncertain; but it is apparently Scottish – and very old. 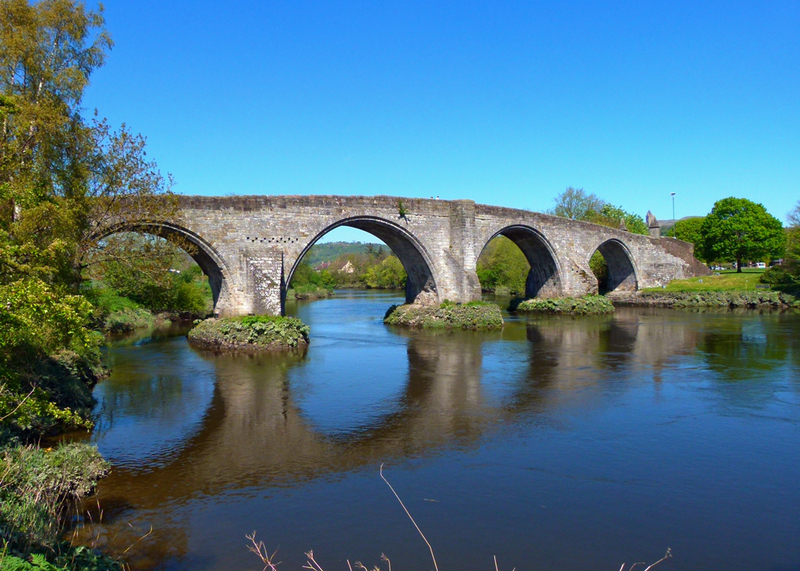 By the way, Wallace is alleged to have made a sword belt from the skin of Hugh de Cressingham, the hated English Treasurer of Scotland and one of the English commanders at Stirling Bridge. The third chamber houses an exhibition that tells the story of building the monument. If you’re in the Stirling area, or passing through this gateway to the Highlands, you can hardly fail to spot the National Wallace Monument. High on Abbey Craig to the north west of the city, framed by beckoning hills, it is an undeniably proud and dramatic sight. You should pop in. Park near the reception centre beneath the Abbey Craig and either take a courtesy bus, or walk up to the monument’s entrance along a pleasant, wooded path. Just bear in mind that the hill is 300 feet high, then you have the 220 foot monument to scale. There is, inevitably, a gift shop which unexpectedly specialises in Scottish things. Even more surprisingly, there is a selection of books about Sir William Wallace and the Scottish Wars of Independence. It might even be possible to buy a DVD of Braveheart. Have a cup of tea and slice of haggis in the coffee shop; it’s called Legends. There are memorials to Wallace all over Scotland, as well as in London, Australia, Canada and the United States. A great deal of information here… I really wanted to climb those stairs when I was there…but my daughter convinced me that if I took a tumble coming back down, it would be the end of our holiday. We were in Scotland for about 23 days….looking forward to another trip in 2018. I did post about my trip, but I left most of the history up to you, and to some wonderful books that have been written…always enjoy reading your posts, especially about Scotland. I’m sure he would love visiting this monument. Thanks for a detailed and interesting article Mike. Love your humor as well! Those stained glass windows look so very good. Great information again, thank you. Impressive! This I didn’t know about. It really is a Victorian architectural extravaganza! Nice to learn a few more details. You get a great view of it from Stirling Castle, across the valley. From everything I’ve read, Wallace really was a hero, regardless of Mel Gibson. (And I do know the story of Somerled). Yes, the opening shot was taken from Stirling Castle. From what I’ve read the sword has been examined closely and is made up of several different swords but tourists expect a two handed weapon and would be disappointed otherwise. So much of Scottish history is myth, legend, or inaccurate- most of it an English invention- like the kilt and tartans. Somerled, Lord of the Isles ( Where Prince Charles got his title from) ruled the entire western seaboard from the Isle of Man, and Cumbria to the Hebrides yet most folk still haven’t heard of him. He was half scot half viking though but he did rule supreme until his death.. Wonderful post, as always. I am thinking of men from Scotland…Eric Liddell, Eric Lomax, J.M.Barrie. These just came to my mind. Always feel a bit funny about the word “heroes” but that is just me. That last photo is really nice. That is an impressive monument. Now I want to see Braveheart. I always thought Mel was Australian. But have discovered he was born in USA but he grew up here and went to our NIDA. Like all good Australian actors they end up in America where there are more jobs and better money. Excellent post Mike, love your humour – Garibaldi and Birmingham, very witty. Discrimination and equality eh, I can just hear those words being bandied around in medieval times! That is a mighty impressive sword. I got my certificate for climbing it in the gift shop:) beautiful views from the top and love the Gothic style of the monument. also, we walked all the way from the road down below, didn’t know there was a van that brings you up to the monument. Love learning about scottish history like this, I’ve traced my grandmother’s family back to the Wallaces and Grahams and Dunlops and Mackintosh’s in Scotland. Such an imposing looking structure! The bridge is a beauty too. A very fair review of the monument. It is a pity that, here and in places like this all over the world, the organisers feel the need to make ‘Hero Galleries’. It just confuses things, I think. Almost like those comments on book blurbs – if you enjoyed this book you’ll love……..etc. I was indeed in the Stirling area, and did not fail to spot the National Wallace Monument – proud, dramatic and of interesting architecture. But as the fighting over political sculpture in the southern states of the USA has shown this year, nationalist sentiment is a source of pride to half the population and a source of pain to the other half. I wonder if some people do not want Wallace made into a national hero. I think there’s a difference between nationalism and patriotism. It’s also easy to view history with 21st century eyes. Of course I’d love to see this in person, but there’s just so much… And Billy Connolly definitely improved my life by his portrayal of John Brown In ‘Mrs. Brown’ with Judi Dench. I hope you avoided purchasing the Scottish oatcakes. I was betrayed by the pretty packaging.